Background: Drug addiction is a major health problem with limited treatment methods. Nowadays, the application of nanotechnology in the diagnosis and treatment of various diseases, such as drug abuse, is increasing. This emerging area of nanotechnology, with its rapid advances in science, opens new horizons in medical science and illness treatment. Nanotechnology research plays an important role in treatment and early diagnosis of pathogens. 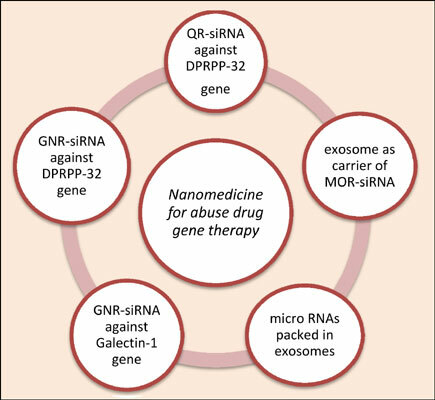 Objective: Given the severity of the social and economic burden of drug abuse as well as the increasing global rate of death from over-consumption of drugs, in this review, we introduce nanotechnology-based gene therapy strategies for the treatment of drug addiction. Method: A number of relevant published articles 249 were initially collected from three popular databases including Google Scholar, Scopus, and PubMed. Articles that did not have much relevance to this article were deleted from the study process. The present dataset finally included 105 published articles. Results: The results of a close analysis of the articles revealed a paucity of research conducted on the addictive drug-gene therapy by nanoparticles. This was supported by the limited number of articles found for the purpose of the present work. Conclusion: Nanoparticles with low toxicity, high gene transmission efficiency and high bio-compatibility were found to have important application in the combination of diagnosis and treatment in addiction gene therapy, and to cause behavioral changes during drug abuse. Gene therapy, nanoparticles, siRNA, drug addiction, mesolimbic, dopamine.